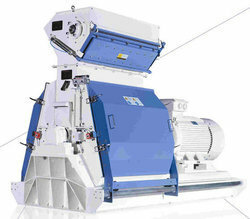 We manufacture and offer a range of premium quality Hammer Mill. We design and develop hammer mills in different sizes to ensure excellent crushing efficiency in diverse applications. The crushed material is conveyed by blower to the cyclone for collection and the dust collector is provided in the system for ensuring dust free operation and resulting into no loss of powder. We provide a wide range of Full Circle Hammer Mills, the range of hammer mill is well-known for the qualitative features of robust construction high output with low power consumption.